and more - for your health. 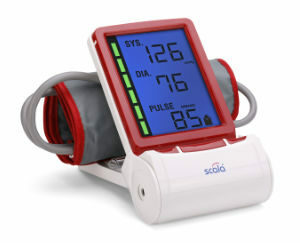 SCALA Blood pressure monitors for domestic use are electronic devices for non-invasive self-measurement of human blood pressure and the pulse rate of adults. We offer a wide range of different upperarm and also wrist blood pressure monitors. A clinical thermometer is used to measure body temperature in humans. It is suitable for the determination of fever and fever processes as well as the basal temperature. Modern clinical thermometers have a digital display. Our assortment consist not only clinical digital thermometers, but also infrared thermometers. Clinical thermometers you can purchase in our e-shop. Infections of the respiratory tract not only occur in the adult age but also increasingly in the childhood. Therefore, nebulizers are used in chronic diseases like asthma, bronchitis or allergies, as well as for example to treat illnesses caused by occupational air pollution. We offer a wide range of spare parts for our products. 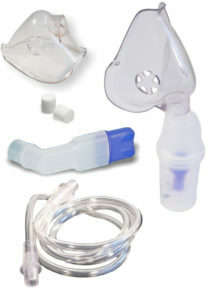 Like filters and masks for the nebulizers or cuffs for the blood pressure monitors. Additionally we offer some products that make everyday life easier. We offer only some but very important products in this area. The rollator for instance, pill box and lice comb are indispensable daily aids for many people. For more than twenty years we have been distributing high-quality medical devices for domestic use under our brand name SCALA®. We do not see our devices as a substitute for a medical diagnosis, but rather as a means for assisting in a therapy (e.g. 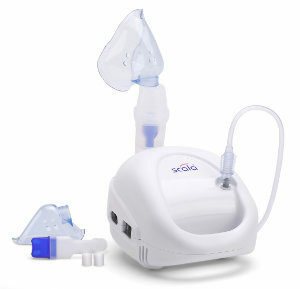 with a nebulizer) or to measure vital body functions like blood pressure and body temperature. Since the beginning, it was our aspiration to bring innovative and high-quality products on the market. Starting off with very low quantities of different kind of products, we soon have been able to get pharmacy customers interested in our product portfolio. Little by little we expanded our presence in the pharmacy business. Today, a large number of pharmacies in Germany, but also in Austria, the Netherlands, Luxembourg and Switzerland are content customers of SCALA Electronic GmbH. After a short time, the quality of our clinical thermometers, blood pressure monitors and nebulizers convinced various large and well-known electronics chains and pharmacy chain stores. Nowadays, our products can be found in many retail stores in Germany and other European countries. The SCALA team has enthusiastic colleagues with many years of experience in the field of medical technology for domestic use. As a result, our colleagues have a very broad knowledge and are able to provide quick and competent answers. We also offer solutions for requirements or questions that go beyond the usual standards. Plus size cuffs for blood pressure measuring devices, technical inspections or spare parts for aged devices usually are not a problem for us. We are aware of our corporate responsibility and are committed to social and ecological goals. As a member of the Business Social Compliance Initiative (BSCI), we want to help to ensure that internationally recognized social standards are respected in the globalized world of work. Due to their high standard, selected products of SCALA have been included in the statutory health insurance directory for medical aids of the National Association of Statutory Health Insurance Funds in Germany (GKV). We are convinced that in the near future each patient will be able to transfer information on his or her current vital functions with his or her mobile phone via email or SMS to his or her doctor. We offer our customers a wide and high-quality product range of digital clinical thermometers, blood pressure monitors, nebulizers and aids for everyday life. Our quality assurance system is fulfilling the requirements of the European standard EN ISO 13485 for medical products and has been certified by TÜV Rheinland (CE 0197). Phone: +49 3329 6045 0.